Walt Gutowski Jr. (left) discusses a print project with 24-year employee Adam Orcasitas. The team at Swift Printing and Communications in Grand Rapids. 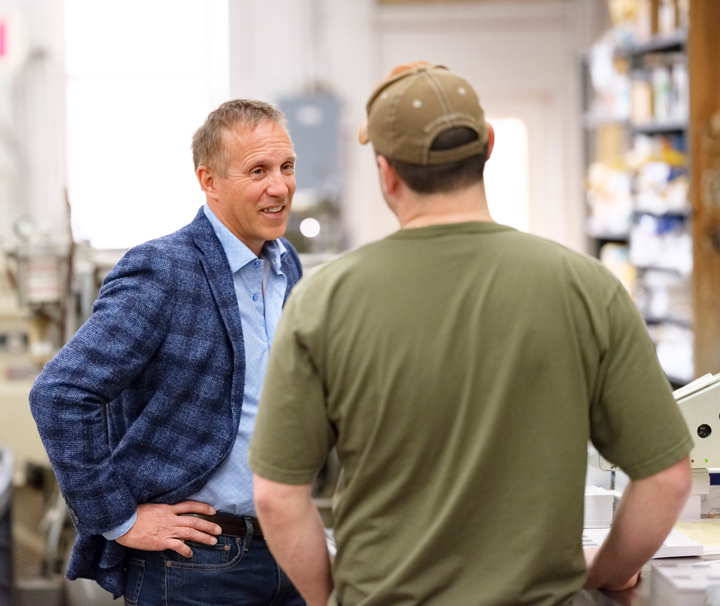 Two years ago, Swift Printing and Communications joined the growing ranks of B Corporations, a circle that includes such forward-thinking companies as Patagonia and Ben & Jerry’s. By making that move, Swift became one of only two commercial printers in the world certified as a B Corp. 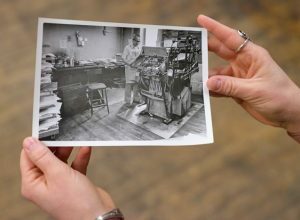 The status confirmed that the Grand Rapids business was carrying out a commitment to its employees, the community and the environment that began when Walt Gutowski Sr. opened the printing shop in 1950. Founder Walt Gutowski Sr. at work in the Grand Rapids-based business, which started in 1950. His granddaughter, Jessica Slaydon, 32, saw value in turning to a third party to assess how well the family business was living up to its longstanding reputation as a good citizen. “My generation is kind of skeptical. Everyone says they are green and they are doing the right things for employees, but where’s the proof?” Slaydon said. B Corp, an international certification issued by the nonprofit B Lab, is similar to LEED for buildings and USDA Organic for food products. Essentially, the designation serves as a way to measure a company’s social impact. It’s a way for businesses to hold themselves accountable for their triple bottom line — social, environmental and financial — and for consumers to know that they’re being held accountable, according to Alice Jasper, sustainable business manager for Local First. “It plays into the shift in consumer trends. We’re seeing consumers want to vote with their dollars and be intentional about what they buy,” Jasper said. Local First, through its Good for Michigan program, is a B Local organization, the only one in Michigan working with B Lab to certify companies as B Corp, and then to provide support to members. The certification is important to mission-driven businesses like Higher Grounds Trading Company, which joined the B Corp ranks in 2016. While the process of becoming B Corp can seem daunting because it requires reviewing nearly every aspect of a business, the effort delivers a return on the investment, says Higher Grounds General Manager Josh Brandt. He credits B Corp for inspiring positive changes at the Traverse City coffee house and wholesaler. “They asked a lot of questions. That got us thinking about areas where we could be doing things differently. They measure businesses on many different aspects of how they interact with the community, how they sourced the ingredients in whatever they’re making, how they treat their employees and the benefits that they offer and their commitments to environmental sustainability,” Brandt said. Out of that experience, the company added paid volunteer time for full-time employees. The perk fit with the company’s mission to confront inequality and cultivate human potential. “We are trying to do that very specifically within the coffee supply chain. We have made investments in projects in communities where we source our coffee that don’t have anything to do with growing coffee, but deal with improving the lives of the folks that we’re partnering with,” Brandt said. Left, Walt Gutowski Jr. and daughter, Jessica Slaydon, took their longtime famly business, Swift Printing and Communications, and joined the B Corporations movement. One way B Corp keeps businesses accountable is with numeric scores. The goal is to keep improving that score overall and in different categories. Reaching for this higher standard can be inspiring for employees, as well, by making them aware of how they individually can impact a score. Customers want more than a transactional experience. They want to make a difference, Brandt says. As part of the B Corp assessment process, companies have to document how they are good stewards. Swift Printing, for example, showed transparency in responding to customer concerns by opening an account on Yelp because complaints there couldn’t be deleted. The business also rewrote its mission statement and reworked the employee handbook to emphasize its values. One of the benefits of the B Corp assessment for Slaydon is that it pushed her to have some important conversations with her dad about the business that had been put off in the daily rush to deal with immediate demands. “This really helped me get facts from my dad’s head into an actual strategic plan so we could talk about those questions that I kind of knew, but we just hadn’t talked about. It was really helpful being the next generation taking over because it made us actually sit down and answer these questions,” Slaydon said. Her dad and company owner, Walt Gutowski Jr., has played an integral role in turning around the Grand Rapids West Side neighborhood. For decades, he has been buying up properties to make it easier for developers to take on bigger projects in the neighborhood, including a five-story building across the street that now houses restaurants and apartments. 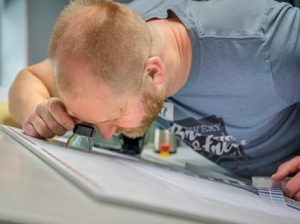 Swift Printing employee Ben Kazminski checks a proof for quality. While he characterizes most of his real estate transactions as break-even deals, they have pulled in millions of dollars of investment for the neighborhood and lifted property values. Sustainability is also a hallmark of the business, especially for Slaydon, who credits attending Grand Rapids Public Schools’ Zoo School for making her a passionate environmentalist. 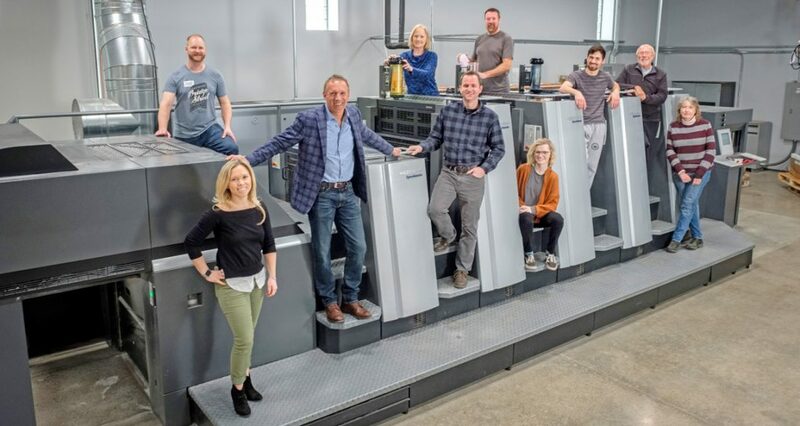 A commitment to the environment is why the family decided to invest $2 million in a state-of-the-art Heidelberg printing press. This German-made Anicolor offset printing press dramatically reduces paper waste. It’s also more efficient, finishing jobs in half the time. Slaydon credits the B Corp process for helping formalize the company’s social mission and values. The goal of B Corp is to raise awareness about what the certification means and why it is important. That’s why Local First, which first focused on the Grand Rapids market, is planning to take its message about what being a B Corp means to a wider audience in the coming months. “We are expanding this year beyond West Michigan to the east side of the state and further north, really trying to pull the full community together,” Local First’s Jasper said. ← Contest, lottery or sweepstake: Which makes the best customer promotion?